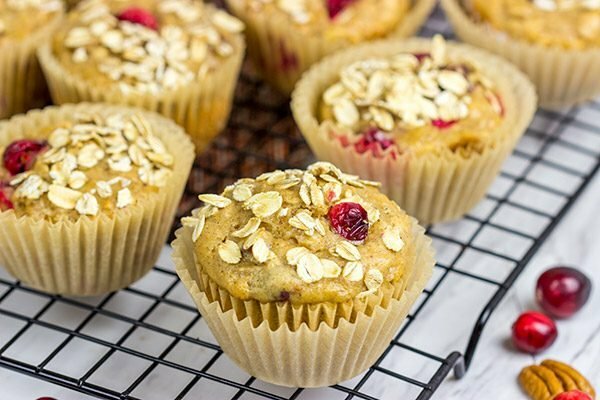 Packed with fresh cranberries, these Cranberry Oat Muffins are a delicious way to start a chilly morning during the holidays! Aside from the good food and time spent with family, one of the Thanksgiving traditions that I’ve always found fascinating is how the president pardons 2 turkeys every year. This roots of this tradition date all the way back to 1863 when Lincoln was in the White House. But have you ever thought about where those pardoned turkeys come from? It’s not like they’re just living in the East Wing of the White House before they trot out to receive their official pardon! It turns out that Minnesota sends 2 turkeys to Pennsylvania Avenue every year for the official pardoning ceremony. In fact, local 4-H members in Minnesota begin training the turkeys in August to prepare them for the light, noises, people and other festivities that come along with the ceremony. And speaking of other festivities, the trip itself is rather unique! The Presidential Turkey Facebook page shared these images from Honest’s and Abe’s (those are the turkeys) trip to DC back in 2015. Look at those cages! Can you imagine landing at Washington Dulles airport and passing these birds in the concourse? But enough turkey talk. Let’s talk Thanksgiving morning breakfast. I know the big meal of the day comes later on, but Thanksgiving breakfast deserves a bit of special attention, too. 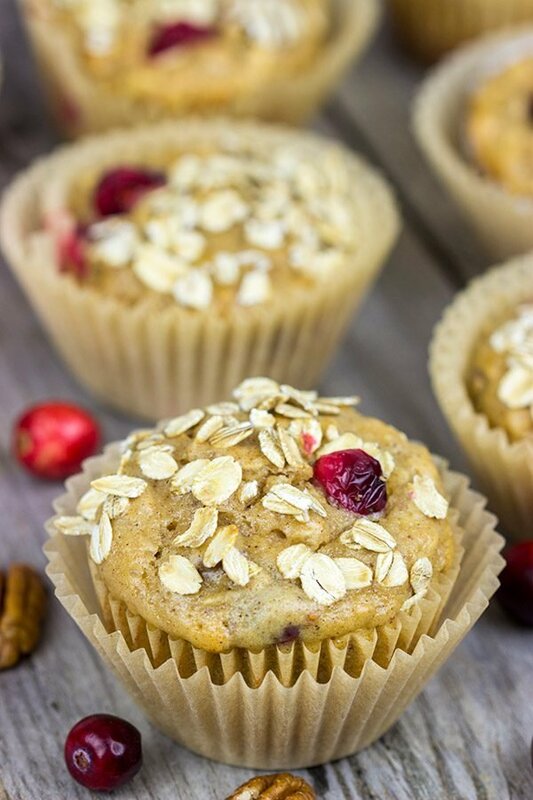 And these Cranberry Oat Muffins are the real deal way to start off the holiday! Cranberries are a classic American (and Canadian) berry, and they almost always make an appearance later in the day in the form of cranberry sauce. 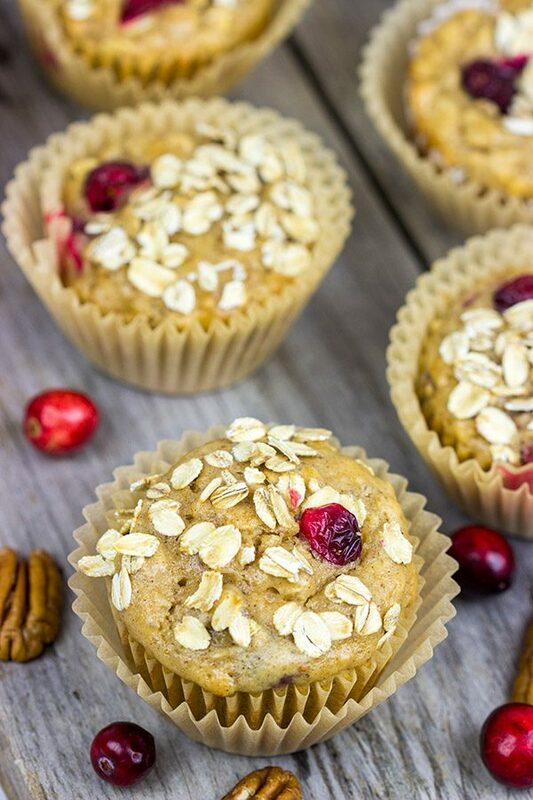 But how about adding some of those cranberries into these Cranberry Oat Muffins? These muffins are a delicious way to start off Thanksgiving…or any other day! I baked these Cranberry Oat Muffins with Bob’s Red Mill Organic All-Purpose Baking Flour. (I also used Bob’s Red Mill’s Old Fashioned Rolled Oats, too. Robbie loves oatmeal, and we always keep a steady supply of these rolled oats in our pantry.) I bake a lot, and I know I can always count on the quality of Bob’s Red Mill products. Their Organic All-Purpose Flour is unbleached, unbromated and comes from certified organic U.S.-grown wheat. 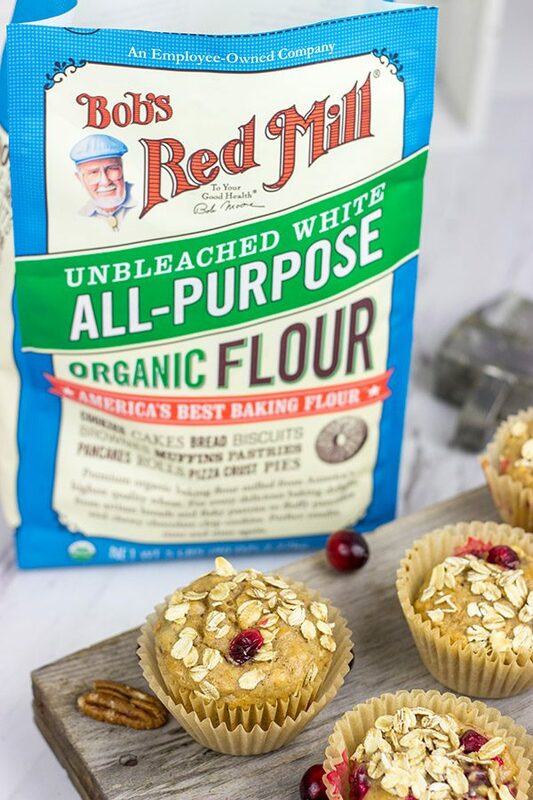 This flour doesn’t contain any additives, and it’s perfect for everything from breads to dinner rolls to cakes to these Cranberry Oat Muffins. If you like to bake (and who doesn’t during the holidays!? ), then grab a bag of Bob’s Red Mill’s Organic All-Purpose Flour for your pantry! You can order online or find a local store that carries Bob’s Red Mill products near you. Now that we have our Thanksgiving breakfast planned out, let’s turn our attention to the rest of the day. What are some of your favorite Thanksgiving recipes? What about other family traditions on Thanksgiving? Will you be out at 4am on Black Friday hunting for deals? I can promise you that I’ll still be in bed at 4am on Black Friday. After all, I’ve got to get my sleep so I can chase a certain toddler around for the rest of the day! Happy (early) Thanksgiving, my friends! Preheat oven to 400°F. 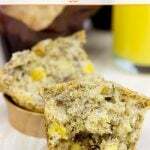 Line a standard muffin tin with paper liners, or grease muffin cups. Using a large bowl, add flour, baking powder, cinnamon, nutmeg, salt, 1¼ cups of rolled oats, brown sugar and granulated sugar; stir until well combined. In a separate bowl, add sour cream, eggs, milk and oil; stir until well combined. Pour liquid mixture into bowl with dry ingredients. Stir until just combined, taking care not to overmix. Fold cranberries and chopped pecans into batter. Fill muffin cups ~¾ full. Sprinkle tops of muffins with the remaining ¼ cup of rolled oats. Bake for 18-20 minutes at 400°F, or until a toothpick inserted into the center of a muffin comes out clean. 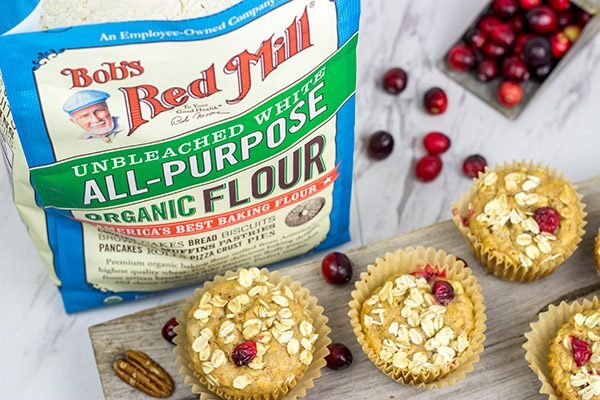 This Cranberry Oat Muffins post was written by me on behalf of Bob’s Red Mill. The opinions and recipe are all my own. Thank you for supporting the brands that support Spiced! Although we celebrated Thanksgiving a month ago, it’s kind of cool to live in Canada and being a food blogger. I think this makes an appropriate thing to contribute few recipes to both holidays. Since Thanksgiving is a relatively new day to us, we don’t have certain culinary traditions. I believe, sweet potato and Brussels sprouts dishes would be our favorite produce. Mac&Cheese sounds like not a very common dish, but I fully support it. Perhaps, butternut squash mac&cheese would be a 100% fit? And so would these delicious muffins. The combo of cranberries, pecans, and cinnamon is a win. Also, David, I’m concerned you don’t normally have any pecan pie leftovers, so please bake 3 this year (And since you won’t need so many pies for yourself, just send me the 3rd). I’m right there with ya on the any excuse to bake bandwagon, Kelsie! Baking is just so fun and relaxing…even if it proceeds a long day in the kitchen like Thanksgiving. So you’re absolutely right about those turkeys. I have no idea how they prepare them for a party. I’m guessing just slowly start introducing music and noise into their pens. (Do turkeys live in pens?) And do turkeys actually gobble? 🙂 I’ll have to make these my first orders of business when I become Chief Turkey Handler! Haha! As you probably know, we already had our Thanksgiving in Canada and now the next time I’ll have turkey is Christmas. I seriously can’t believe how fast time is flying by! These muffins would be perfect to have for breakfast before the big meal – I bet these would also be lovely Christmas morning with coffee or, ya know, 3pm when I get a little hungry 😉 P.S. that’s kinda funny about the turkeys! Only for the pics, I would think it was a joke, lol. Have a great week, David! Yes! I remember you mentioning Canadian Thanksgiving a couple of weeks back. It always throws me for a loop since your holiday is so close to ours, but it’s still far enough away to confuse me. Haha! 🙂 Can you believe that Christmas is right around the corner now? Well, maybe not right around the corner…but certainly down a very short hall at this point. These muffins would honestly be good on any chilly, Fall or Winter day. They’re delicious with a cup of coffee…I speak from experience here! Thanks so much, Dawn!! Hi David! These sound perfect for a holiday morning! When I make muffins it means I am not making breakfast because I have plenty to do to get ready for dinner! One dish that is always on the menu for Thanksgiving is corn casserole. I also make my traditional sausage dressing and cornbread dressing. I’m addding mac n’ cheese this year! I hear ya on the muffins, Dorothy! And I’ve gotta say that the oats and cranberries in this version are quite fun. I love baking with cranberries at this time of the year! Also, corn casserole. Oh man, I haven’t had a good corn casserole in years. I might have to see if I can convince Laura to let me add that to the Thanksgiving table this year! And yes to the mac and cheese…it wouldn’t be the holidays without a big pot of mac and cheese! 🙂 Thanks so much, my friend!! 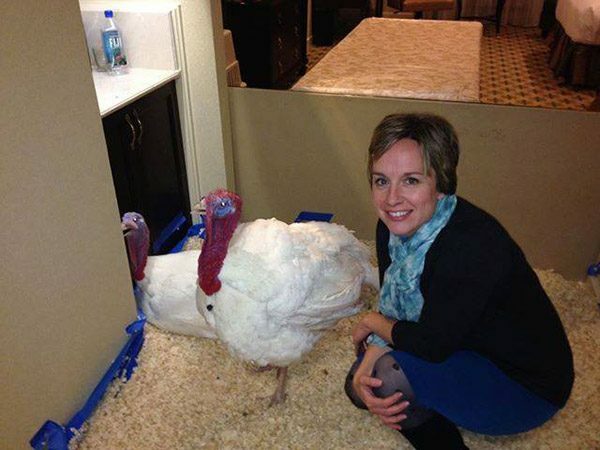 I’ve always marveled at the turkey pardoning tradition. 😉 Interesting to hear how it came to be. These muffins are a perfect way to begin Thanksgiving day – just a little delicious treat to save room. Breakfast on Thanksgiving is a necessity – it’s the only meal before the big bird! So you need something to get you through the cooking marathon! These look perfect! Gotta get my cranberry fix while they are in season! Thanks for the recipe, David! I totally agree, Laura! We only eat breakfast before the mid-afternoon feast, so breakfast really needs to count. I love the oats in these muffins, and I really do try to bake with cranberries as much as possible this time of the year. They’re tart and delicious all at the same time! Thanks so much, my friend! Haha! I had no idea they needed to train the turkeys that are pardoned. I don’t know why I think it’s funny but I do. Love these muffins. What a great way to get the cranberries in all day long! I agree, Stacy! It seems odd to think about training a turkey, but then again it kinda makes sense. I mean we don’t need those turkeys running amok down Pennsylvania Avenue, right? 🙂 Also, these muffins are super fun…I love baking with cranberries this time of the year. Thanks so much for stopping by, my friend! I would love to wake up to these muffins on Thanksgiving Day. It is so hard to believe that Thanksgiving is next week. My family would love to have mac and cheese for a side on Thanksgiving Day. I totally agree with you, Dawn…Thanksgiving is sneaking up on us this year! But I’m ok with that. An early Turkey Day means an early start to the Christmas season…and that means more time to enjoy the decorations and tree! 🙂 Happy baking, my friend! Sounds like we have a lot in common there, Neil! And you know what’s funny, we typically like to do turkey again for Christmas. 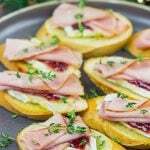 Not only is it delicious, but leftover turkey sandwiches are a thing of beauty! Although I am thinking about possibly trying a beef roast for Christmas this year. We’ll see! Haha – David you are spot on about the pecan pie – we never ever have leftovers of it! And, am thinking if I were to make two they would disappear in one day as well – Lil Shashi cannot keep her hands off pecan pie! As for Thanksgiving traditions – well, Thanksgiving wasn’t part of my early years – so, we really don’t have any. 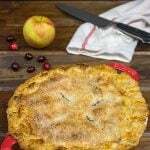 Even now, unless we head to a friends place, we don’t really go all out for Thanksgiving – besides, I’ve already made and enjoyed some of the Thanksgiving dishes though, Christmas is another story! By the way, I just got some of that Bob’s Red Mill flour and I sure have to give these a try after the cinnamon rolls I have going right now. These are perfect throughout the holiday season! Happy early Thanksgiving to you, Laura and Little Robbie! You know what, Shashi? I think you’re right about the pecan pie. It doesn’t matter how many I make…there will be no leftovers. None. Zilch. 🙂 Also, thumbs up to this Bob’s Red Mill flour! I use a lot of flour around here, and their products are always top-notch! And now I’m off to find my Santa outfit! Hah! Halloween has gotten so huge, that by the time you’ve recovered, there’s no time to get ready for Thanksgiving! Fortunately, I’m not making dinner this year. Well, I shouldn’t say “fortunately,” because I love making Thanksgiving dinner. Fortunately, though, in the sense that I don’t have much to prepare (I’m just bringing a few loaves of bread, and maybe some cookies) – which is good, because I do not have the time! These muffins, though, would be a great add to my bread basket. Thanks for the timely recipe! I’m with ya, Jeff. I do love Halloween, but it does mean that Thanksgiving gets the short end of the stick…especially when Christmas has started creeping into Thanksgiving season. (Wait, did I say Thanksgiving? Christmas has started creeping into Labor Day I think!) Sounds like you’ve got great Turkey Day plans in the books. Homemade bread will definitely be involved here, too. Thanks, buddy! I love whipping up some muffins, and these look so fall festive with the cranberry color pop! these sound awesome! i’m trying to get as much fall baking in as i can (: i’m in charge of dessert this year, so i think i’m going to do something cranberry (though dessert typically changes every year, and there aren’t really set favorites). my favorites though are garlic mashed potatoes and jello salad! Hmmm….dessert, eh? Do you like coconut? I have a really fun cake I posted last year (maybe the year before?) for a coconut cake topped with sugared cranberries. It was definitely festive! Festive and delicious. Of course, I say start the day off with a batch of muffins because, well, muffins. 🙂 Happy (early) Thanksgiving, Heather! !